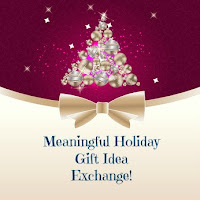 Welcome to the meaningful gift idea exchange. This is very simple, it's basically just a chance for us to share ideas that are more personal and relational in nature than the usual gift ideas we get! You can do whatever you like for this--make a list of suggestions, share a recipe, tell a story...whatever you like! The idea for this was born when I realized I was broke this year. And also that quick material gifts never make a lasting impression.